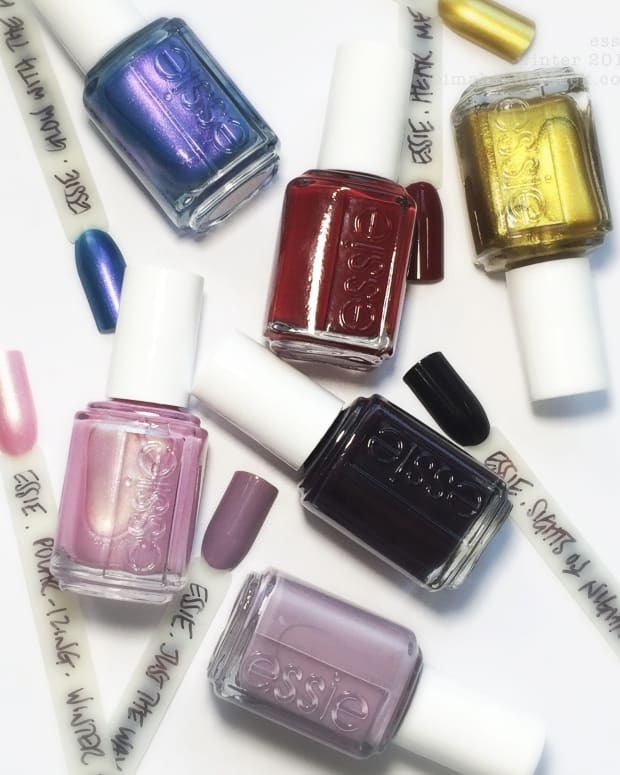 As cold weather approaches for many of us, this new release from Essie looks to hazy desert visions for inspiration – and the formulas are a surprise. 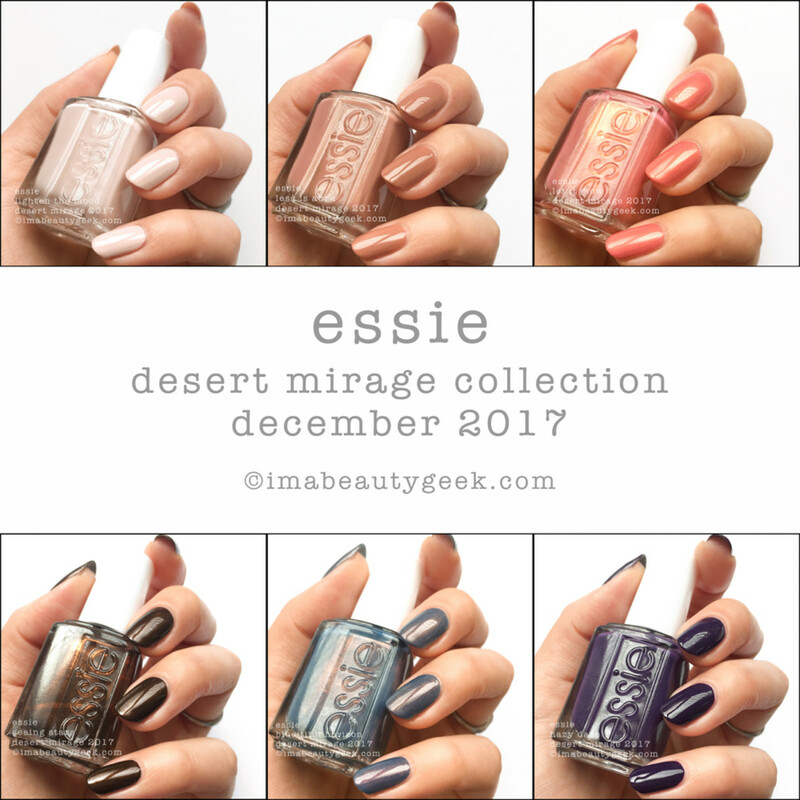 Launching here in Canada sometime this month (or possibly next), comes the new Essie Desert Mirage Collection. 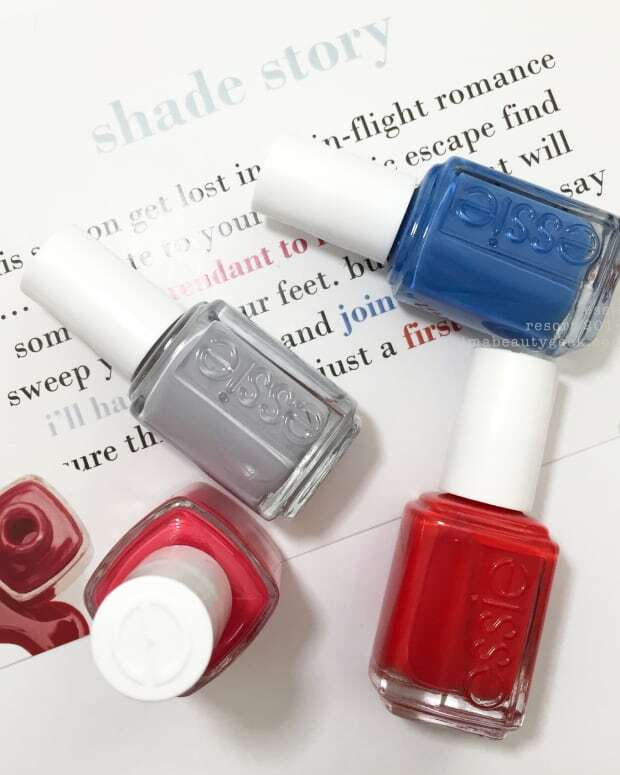 It’s 6 shades to help you break up the monotony of winter – let’s look ‘n see if they do! 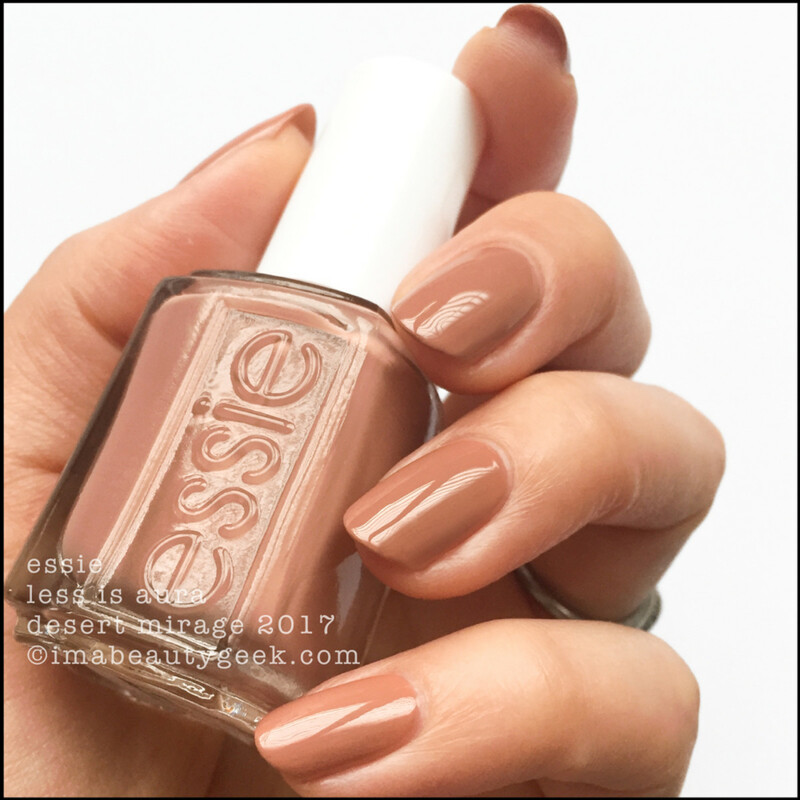 Essie Lighten The Mood – Desert Mirage Collection 2017 (above). Oooh! A simple, sophisticated palette cleanser! If you have less real estate than I do, you’re going to have nuthin’ but love for this shade. Me? Not so much love. Why? Because that’s 4 tricky coats with a skinny brush. 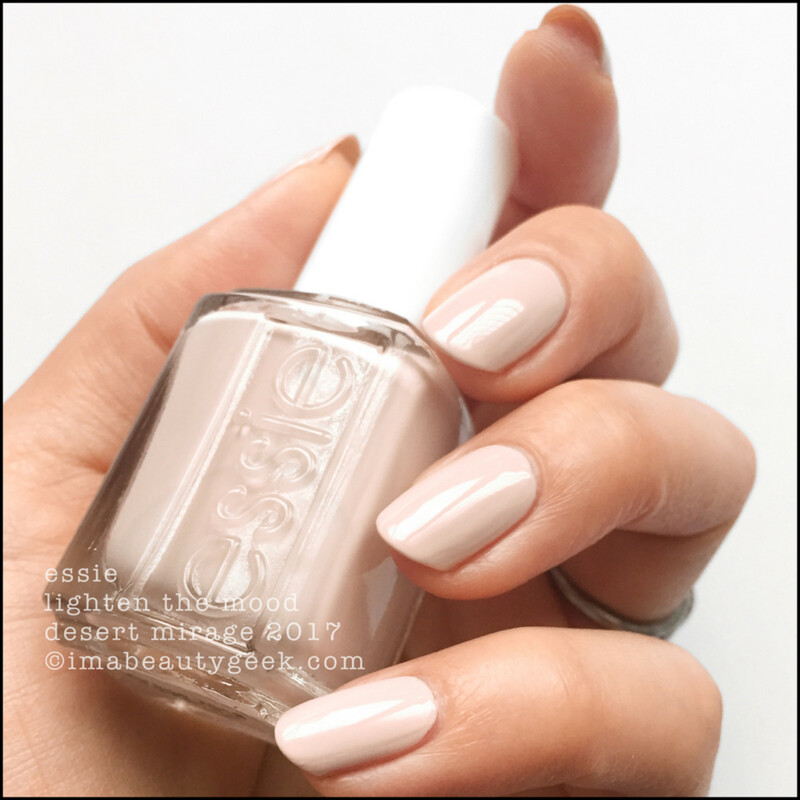 Essie Less is Aura – Desert Mirage Collection 2017 (above). This formula! The level on it is fantasticalz! Depending on your polishing style, you can do this in one massive coat or 2. My fingers all have 2 and my thumb has 1. Amazing, right? It levels like a dream – even with dat brush. 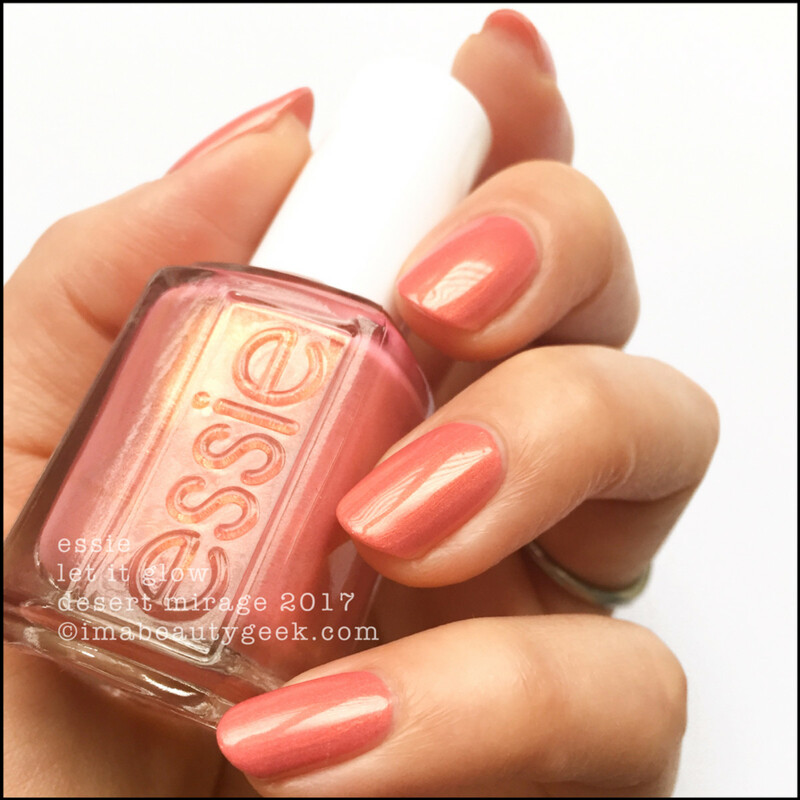 Essie Let it Glow – Desert Mirage Collection 2017 (above). Another magnificent formula in 2 coats. It’s so good that I painted a fuzzy onto my ring fingernail and didn’t even try to pick it off. I was all “Man, this formula is so good it can totally hide that shiznit”! And it did – you didn’t even notice it until I pointed it out, right? 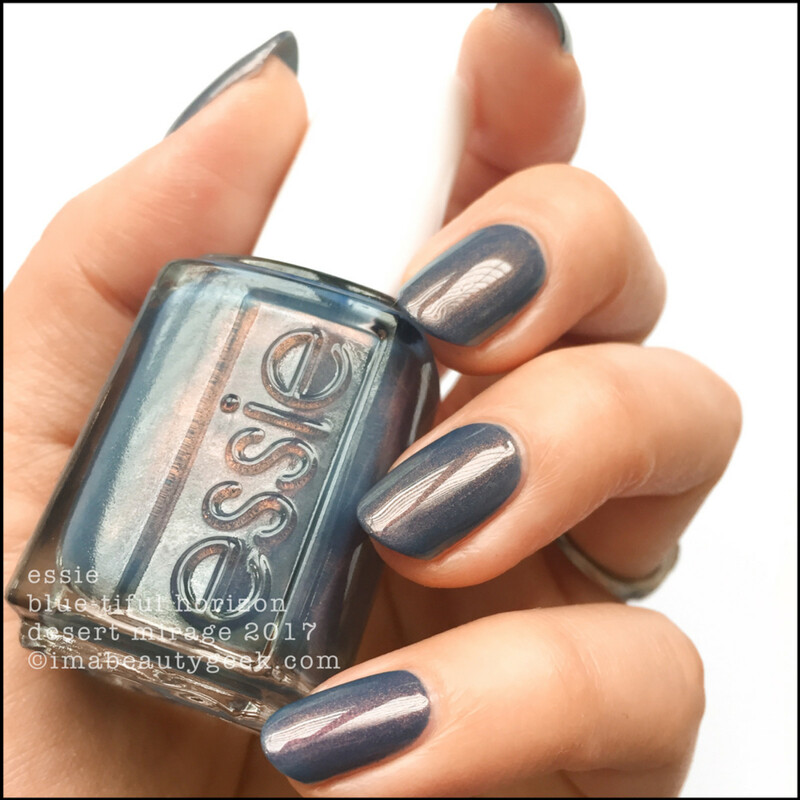 Essie Blue-tiful Horizon – Desert Mirage Collection 2017 (above). Whut?? So much flawlessness! This shimmery in this dusty bluey grey is just smashing. 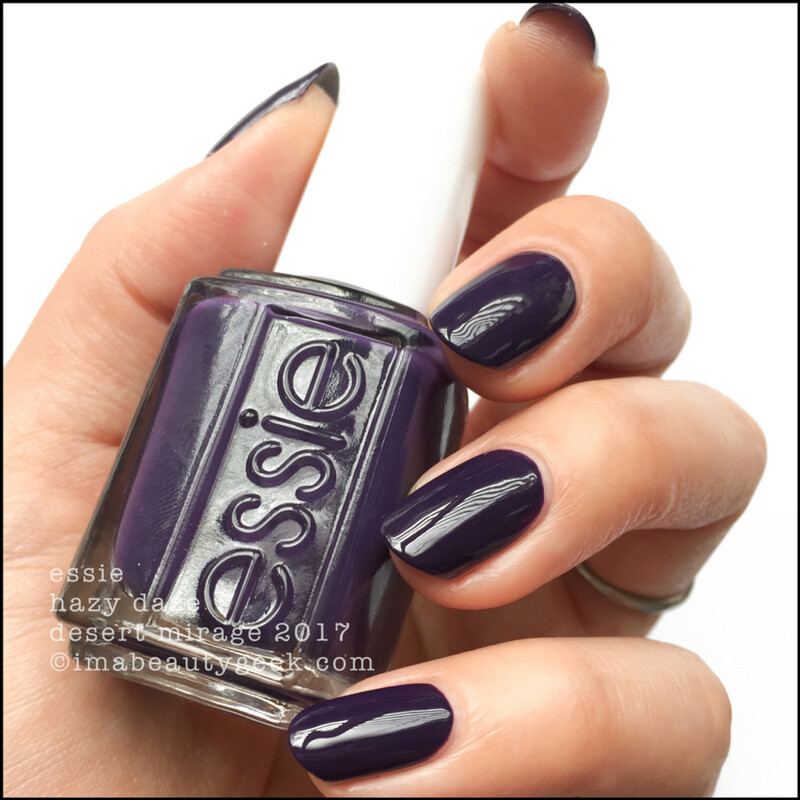 Yes, it’s the same pigment Essie has been using all over the place, but here it’s like this shade and that shimmer were meant to be together – forever. 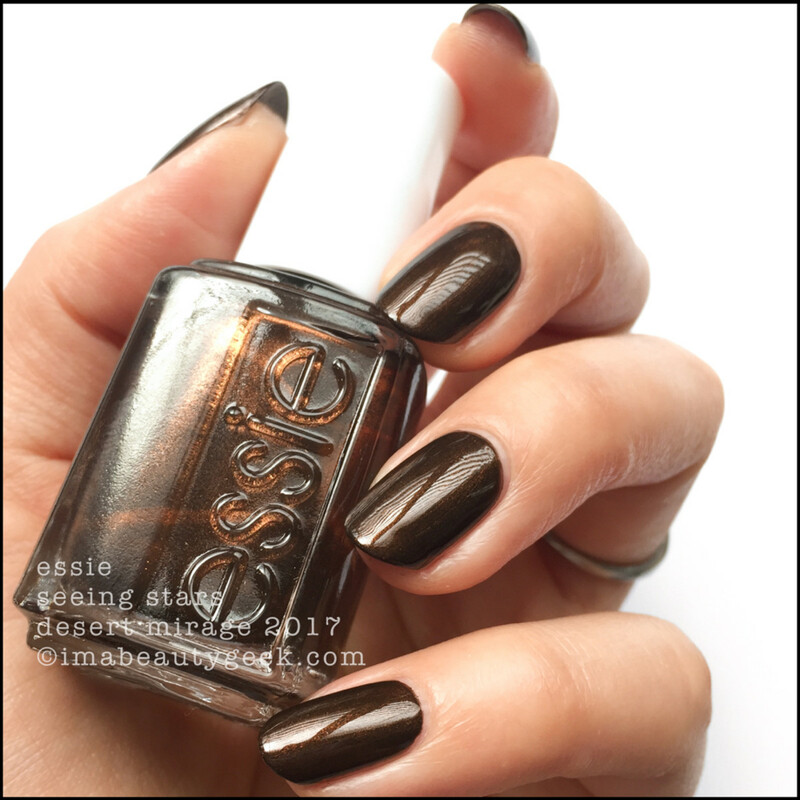 Essie Seeing Stars – Desert Mirage Collection 2017 (above). You can probably OCW this shimmery, underlit espresso, but I didn’t. I did 2 because I’m a fan of maximum saturation. These formulas though! Did I mention they’re wicked-good? They are! 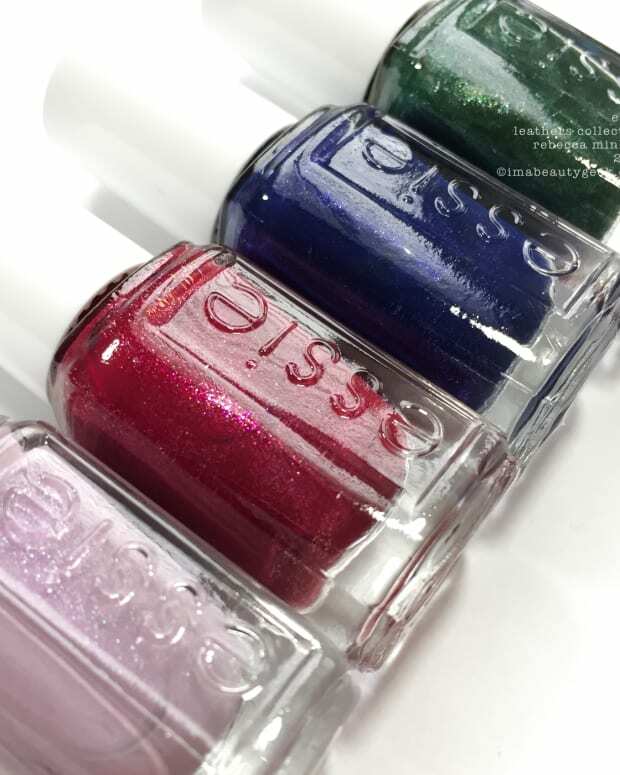 Yes, Essie! Yes! 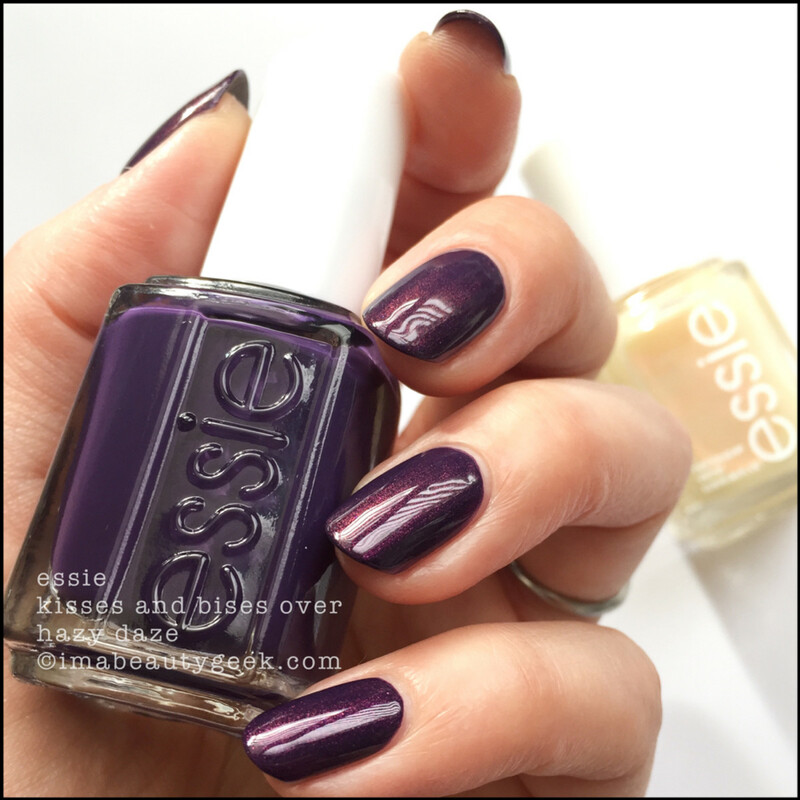 Essie Kisses and Bises over Hazy Daze (above). Gah! Amaze! Do it because I told you to! Do it because you can! I don’t care why you do it, just do it. Then tag me on the IG so I can see it and smile with you, yes? I love this so much that when it was still wet, I sent a quick photo of it to my pal Rita Remark (Essie&apos;s global lead educator & nail artist extraordinaire). Rita came back at me saying she&apos;d procured herself a coupla bottles of Kisses & Bises so she could do exactly the same thing! Nail twinz! 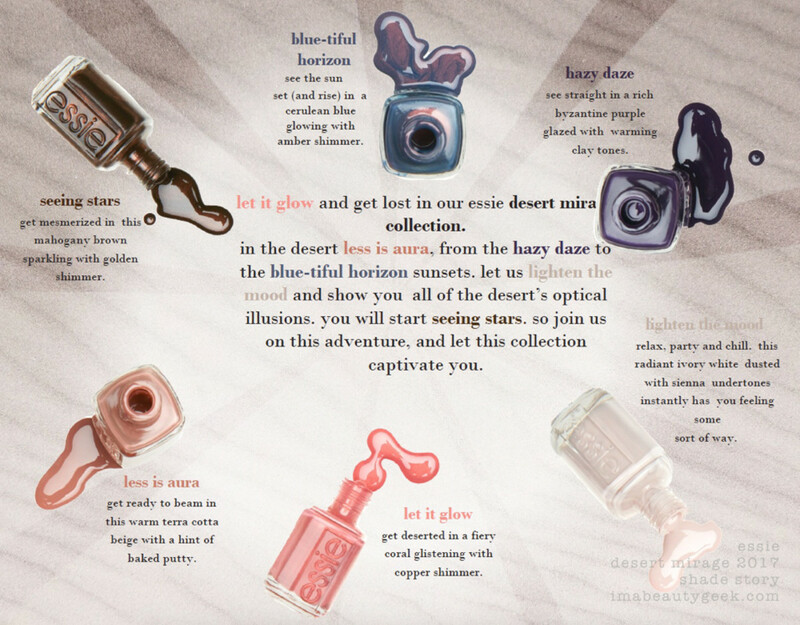 Your Essie Desert Mirage Collection lands on-counter at all your regular Essie retailers across  Canada sometime soon. You gonna? Does it speak to you? If yes, stalk your retailers and keep your eyeballz glued to amazon.ca. And ermahgerd! I just checked amazon.com for you and they have it in! Whuuut?? Shop! Shop now! It&apos;s sellin&apos; faaaaast! Manicures & photos Karen Falcon (she wonders if Essie Mirage replaces Essie Resort).